We booked a all incusive holiday again this year as we wanted a hotel where we had no worries regarding food,drink,snacks with the added security for both our children to have a little frredom to explore. It is a greek 5* hotel and little extras like mini bar, waiter service for drinks in the impressive balcony area where leithure suites and arm chairs await you on an evening,maid service evaryday and free towels for beach or pool. I would rate it a four star with the increase to a 4+ if the rooms were swept and mopped a little more thoroughly. Food was lovely and plentiful with the only negative being as we are non-smokers in Greece you can still smoke in the indoor bars... But alot of people are outside and there are always plenty of areas to sit! As alot of folk before this review have said most of the beds do go early but never did we go with out so dont worry about that!Location is great if you want a busier place .simole go else where!!! All staff spoke better english (+other langs) than most of the guests. Waiters,bai've not mentir staff,cleaners,life guides and any others.Entertainment staff were the best ever and increddibly funny and hardworking . 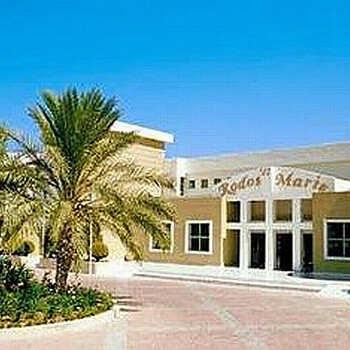 Had some reservations about this hotel after reading many reviews on different sites, when we arrived we were pleasently suprised, the hotel was very nice, staff very friendly food was very good, the Italian taverna was superb, chinese was okay, we did'nt go to the greek restuarant but we heard it was good! I would say this hotel is more of a 4* than 5 but we enjoyed it and the kids loved it. Lifeguard by the pool everyday, he worked very hard and loved the kids.The animation team was from varying countries mainly Italian, they were fantastic great fun!! In fact they were one of the best we have ever seen. Beach was shingled but was nice. Overall we really enjoyed this holiday and would go back again. I would recomend you get a taxi to this hotel as the coach transfer can take 1 1/2 to 2 hours, we booked our taxi through our travel agent and only took 40 mins to hotel. Great Hotel, very impressive, Hotel gives an air of a 5* standard.Cleaners on the go all the time. This is my 10th time at AI,i must say its the best ive been too, no cups and litter blowing around, very clean and well presented. Food was great,spoiled for choice,because you didn't want to miss a particular dish,your plate became rather full, much to the suprise of the other Europeans. Italian taverna was superb,Chineese was superb,didn't book the Greek restaurant but wish we had. Hotel right on the Beach. Beach bar with AI, free sunbeds and parasols,activities all day. Kids club was great,kids had their own restaurant. Kids pool had a life guard all day, also water slides. Free pool table. Entertainment was very good,good atmosphere in the captive audience. Good long walks in the well kept grounds of this Hotel, unless I was very lucky, this Hotel was everything you could wish for. Go for it. This hotel has a lot of steps, very steep steps, lots of different levels around the complex and the main part of the hotel, there are some ramps instead of the steps for you to use but again these are very steep and indeed quite dangerous. None of the staff seem to want to help any holiday maker, no staff were rude but nobody was plesent. We booked this hotel because of its good reports on the spa, mmmmmm, the spa closed six months before our booking but yet the rep (salesman) at the time of booking assured us it was an excelent spa. The hotel itself had a major fire the week before we arrived. A quick lick of emmulsion on the walls was not enough to get rid of the stink of smoke. Food??? Everything is covered in salt, salt and more salt. Even the salad was covered in salt. Sandwiches that were available throughout the day were in short disgusting. The chinease restaurant - service poor, got main course and then the rice for the main course 10 mins later. It also shut shortly after we arrived. The wine was like paint stripper. When we talked to the rep about our concerns, the response was very poor, she advised that now they have our money, they wont do alot. My mothers room was like a prison cell, could not open the shutters - very poor and the telephone did not work. This hotel far exceeded my expections. when we travelled to the hotel there was a fire in the main building. to be truthful the hotel staff did not cope with the fire but its sister hotel gladly put up the families with no electric for the night. We couldnt have asked for better help from the two hotels that night as my eldest daughter suffers from panic attacks and they managed to calm her down and reassure her. When we went back to the hotel the next day decorators were already there and all was running smoothly as ever. the location of the hotel, yes is far out, but this was what we wanted. The hotel is also not too big as i have to be careful when booking hotels because of my youngest being deaf. Both daughters (15 and 12) were entertained throughout the holiday and we were all impressed with the food and drink. Free minibar and clean towels everyday was an added bonus. cant wait to go again and would recommend the holiday to anyone interested. thumbs up. I am a disabled male and in a wheelchair. Prior to my arrival i had contacted the hotel direct by e-mail to inform them that i was a wheelchair user and would need a suitable room. This was also requested by travel agency I booked my holiday with. All this was confirmed in writing but upon arrival at 6.am. the room given was totally unsuitable for several reasons. The porter was very helpful but obviously restricted in his authority so we were told to come back after 9am. This we did and with a little pressure a suitable room was found but not available until 2pm. We could use the first room as a temperary measure!! A bit dissappointing considering all had been checked and confirmed!! From then on our holiday just got better by the hour. The air conditioned room was a little small but hey we spent very little time in it and it was serviced and of a good clean standard. Both the bedding and towels were changed frequently along with pool towels changed as and when you like. The walls were a bit thin but after a hot, long and lesiurly day one soon nodded off. Upon departure which was 2.30am. we were able to keep our room until 9pm which was adeqate along with a baggage storeroom available in reception with safe deposits boxes if required. There were 4 dining areas. The main being air conditioned but with a large outside dining area also. The management and staff were always on hand being both friendly and polite. It was always a pleasure to dine there no matter what time of day! Yes the food was a little repetative but there were several ways in which to make your own exciting combinations of a meal. At times myself and partner often took over 2 hours with our breakfast enjoying the sunrise along with the ambiance of the pool and surrounding hotel areas, enjoying an ever continuing flow of coffee from some very friendly and happy staff! Both lunch and dinner was the same atmosphere and with some different staff but all just the same with there smiles and friendliness. The second was the Taverna open both for lunch and dinner pre-bookable sittings at reception the day before. We dined here once. Ideally located lunchtime for those on the beach who required a little more than toasties from the beach bar, and those in the evening who either enjoyed the views of the sea or with children looking for fresh pizzas etc. The third being chinese and offering a limited popular selection. Again this was only available evenings and pre-booked the previous day. A voucher was given with a time which you had to leave the table by! We found the service slow and the portions small however the food was of good quality.The staff were nice but lacked the friendliness and atmosphere of the main dining area!! We did not try the fourth. Yes I agree with some of the other comments regarding the location of the hotel, It was well out of the way requiring bus or taxi to get into town etc. However both our children aged 13 and 14 had quickly made lots of friends and were soon dining with them as a group which left us to enjoy a relaxing holiday but with regular check in's from the children. There was a good sometimes basic entertainment program for the toddlers to the pensioners and all seemed to be having fun!! The children were already planning their return next year well before the end of our holiday. We arrived late at night after 1 hour transfer by bus. Check-in was a bit chaotic and receptionists were not really pleasant; the rooms that we had booked were supposed to be with sea view, and the rooms given were not. We spend two days and many discussions to change, and to have finally what we paid for. Basically, it was the only bad surprise of our stay, everything else is very good or even excellent. Arrived on Thursday around 4pm, after a 50minute taxi ride from the airport (well worth it, better than a transfer which can take upto 2 hours). Checked in, no problems, and luggage was taken to our room (bungelow, with beach view). Room wasn't as great as we had expected (we had some broken furniture, cupboard etc.) but hey, when you're on holiday you don't spend much time in your room - it was clean & tidy, and the mini bar was filed up every other day (without any fuss). Small tip, if you leave a note and a couple of euro's in the fridge asking for more drinks (Stella, Pepsi, Water etc) they'll fill it up, otherwise you may run out. Food standard was OK if a little salty, but did become a bit repetitive. We ate out a couple of nights at couple of restaurants at the end of the road, adjacent to the beach. The one on the right is best (cheapest - for four people with wine 64euros, although service was slow, but extremely friendly. The animation team were second to none, AB FAB - Rico & James were especially nice, kept everyone ammused with games around the pool, and generally had fun. Taxi from Rhodes airport very easy. 43 Euros and 50 minutes journey time.Very easy to check in and bungalow room was a great size with sea view. Fridge was very welcome with cold drinks replenished every other day.Main restaurant was lovely. Food was good, only repeatative if, like some,you piled all the choices on one plate at the same time! Very pleasant waitresses.The Taverna was a nice change to the main hotel, all outdoor seating.Food cooked fresh. The Animation Team were great and worked very hard. Volleyball,Boules on the beach and Darts,Archery, Waterpolo and Stretch around the hotel pool are good fun but just say no if you dont want to join in they wont make you! The pool is lovely. Cold in May but refreshing.It is slippy on the tiles but only if you aren't careful. This hotel would not suit those who like to walk around the shops in the evening or visit different bars. No need to as the Lounge Bar looks out to sea and the cocktails are a treat. Advise - do not have ice, just adds to the water in them already! Overall a great week. Good month to travel as I can imagine July and August will be much busier and a lot hotter. Good weather but at times very windy. Good value for money. After a late evening arrival we were given a room in the main hotel. I thought all the rooms were in a garden like apartments around the pool so the next morning asked to move but receptionist explained about noise etc and we decided to stay put which was ok. The room slept 4 of us could have been a little bigger but wat a view of the sea beautiful and clean the room staff were excellent clean and tidied up our mess. Food was great wat a variety cooked to perfection and the kids loved the breakfast pancakes they had 25 throughout the week. Location was ok a bit remote but quiet and that was what we wanted. Entertainment team fantastic rico james wink wink was excellent and all the rest victor loved his wolleyball and they all made an effort to talk to us and remembered our names lots of things for all to do kids enjoyed it which left me to sunbathe. April it was still hot still got the tan to show all in all we are going back next year we were sposed to goto the rodos village but was told on the bus that it was not opened yet as one opens early in the season from year to year so be careful if its that particular hotel you want we had a fantastic time .